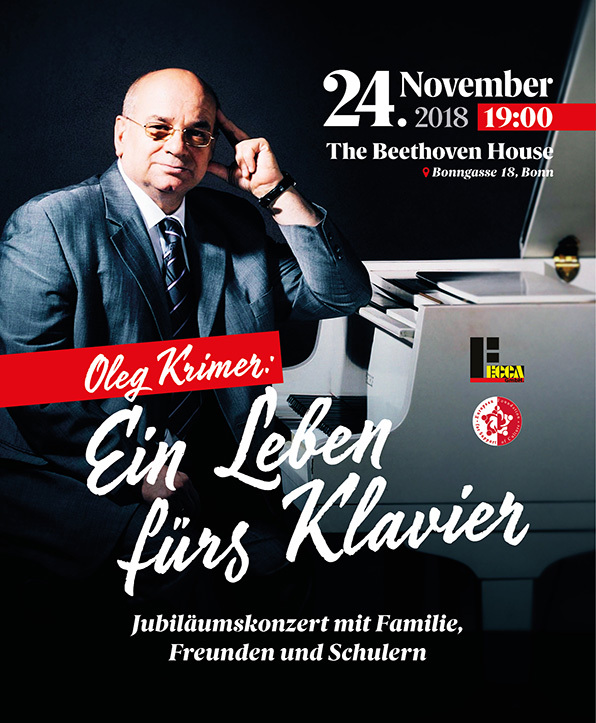 The year 2018 will mark 45 years since the beginning of the teaching career of the world-renowned pianist Oleg Krimer. To celebrate this anniversary, the European Foundation for Support of Culture, together with the European Centre of Culture and Arts (Germany), will host the Krimeriada Festival. Oleg Krimer is a laureate of national and international competitions, famous for his inimitable virtuoso piano playing. Over 20 compositions were created specially for Oleg Krimer; solo recitals and concerts with orchestras, which he performed in world-class concert halls, having won universal acclaim and the love of the audience. In 1998, his performance of new works was acknowledged with the award of the best interpreter of contemporary classical music at the K. Penderecki Festival in Krakow. Following a successful teaching career at the State Music Academy in Belarus and the Music College for gifted youth in Minsk, he moved to Bonn, Germany, in 2000 where he opened up his own school. Over 100 of his students are winners of international competitions, including, Jugend Musiziert (Germany), the Chopin Youth Music Competition (Poland), the César Franck international piano competition (Belgium), UNISA International Piano Competition (South Africa), and many others. The festival will consist of a series of concerts, with one of them to be held in the famous Beethoven House in Bonn. Oleg Krimer will perform music by Tchaikovsky, Shostakovich, Schubert, Chopin and Bach, both solo and with his best students. The festival will also include a piano master class for young gifted pianists, which will be conducted by Oleg Krimer.